The use of ink in EAS hard tags is nothing new in the industry. Ink provides both a visual deterrent and an effective method of security for merchandise. Every company in the EAS industry manufactures and sells a variety of tags infused with ink. The one drawback to this is that a hard tag is an ink tag or it isn't; there is no adaptability...until now. WG Security Products now provides retailers with the option to make ANY hard tag an ink tag with the Ink Pin. 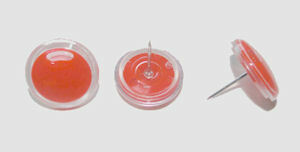 The pin is a rounded plastic bubble, filled with bright red ink, welded together tightly to prevent leakage. It features a grooved pin and is compatible with any ball-clutch and clip mechanism tags. The Ink Pin can add a visual deterrent and an aesthetic upgrade to an otherwise bland-looking tag. Insert the Ink Pin into an alarming tag for an extra layer of security to your more expensive items. For budget-conscious retailers who use dummy tags as a deterrent-only method of loss prevention, adding the Ink Pin to a dummy tag turns the tag into a full-fledged security device. WG Security Products, the Innovators in EAS-RFID-CCTV.